Serve volleyball short is a strategy more teams are starting to put into practice. Most teams dont practice passing short serves. Most teams don't serve short themselves, so therefore, most teams aren't experienced passing short. No matter how experienced, players are always going to be uncomfortable passing short serves. Passing short serves is always going to be awkward and it's likely players are uncomfortable passing them. No one wants to pass short serves because the angle and trajectory of the ball is unusual. The advantage of serving short is, "short serves take a team out of system." Make the #1 option hitter pass the serve. On most teams the outside hitter is the #1 option for attacking. If the outside hitter is LEFT FRONT and passing in serve receive, serve her short. You want to put pressure on the outside hitter because they are the primary attacker. Also, it's harder to take a big approach if you first have to come in short to pass. You may notice that sometimes the setter doesn't even attempt to set the outside hitter if the outside passes the serve. If this is the case, you can eliminate the #1 attack option just by serving her the ball. In this situation, the blockers at the net should recognize this and anticipate an attack from the middle hitter, left side hitter, or whoever is likely to be set in that situation. Serve volleyball zone 4. It's absolutely critical your players learn to serve zone 4. This is related to serving short on the outside hitter when she is LEFT FRONT. NOTE: Many coaches make the mistake of focusing on serving the weakest passer. Especially at a higher level of volleyball, serving the weakest passer isn't the best strategy. It's better to focus on, "taking your opponent out of system". This means serving them in a way that keeps them from running an effective offense. If you can serve zone 4, you'll very likely take your opponent out of system every time. Serve volleyball zone 2 if setter is right back. If you serve zone 2 when the setter is RIGHT BACK, it will make it difficult for the setter when moving to set. Serve serve volleyball zone 3 if the libero is deep. The first time you do this, you will likely get an ace if the libero tries to pass the ball. Also, this is a strategy that's best to not do very often. Probably best to only do once or twice a match because the libero will often make an adjustment and pass the ball. If the right side hitter is hurting you, serve them. If the right side is the best option for attacking, serve them short and take them out of the play. This will make it much easier to block and play defense if you eliminate the #1 option. Serve a jump floater short. 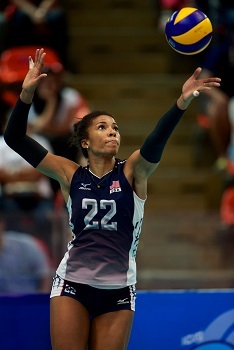 One of the toughest serves to pass is a jump floater especially if you can serve it short. When you're learning to serve short, you're also learning to pass short serves. If you're learning to serve short in practice, your teammates can practice passing your short serves. This is really important because if your team can serve short really well, they will likely have learned to pass short serves. This will give you a big advantage over your opponents that haven't practiced serving short. You're learning to pass at an unusual trajectory. When passing a short ball, the angle and trajectory of the pass is unusual. The passer must take the ball higher (higher forearm platform) when forearm passing. Learning to pass short will help you be more comfortable with your overall passing skills. In my opinion, as a server, the short serve is the easiest serve to be the most consistent at executing correctly. When learning to serve short, concentrate on serving the ball just across the net and having it drop short. As a player, Im more confident that I can consistently place the ball short than anywhere else on the court. Many coaches are afraid that if the server hits the serve high, angling the ball to drop short, they will be giving the other team plenty of time to receive the ball and make a good pass. I have to disagree with this philosophy. Whats important here is where you place the ball. Remember, your goal is to take the team "out of system". It doesnt matter so much if they know where you are going to serve (when it comes to serving short). Just about every short serve is tough to pass and will likely take them out of system, even if they know its coming.